Do you like pancakes that are fluffy on the inside? Do you like them lightly crisp and golden brown on the outside? Mmm… I have the perfect recipe for you. What’s more, you can also add other ingredients like chopped fruits, chocolate chips, and nuts to the batter. In this recipe, I have decided to add sweet corn in. Sweet corn is high in fibre and adds a nice crunch to the pancake too. Grease the pan with Q.B.B. ghee and you will really love your pancakes. Better yet, place half a teaspoon of the Q.B.B. ghee on the hot pancake, see it melt in and give you an awesome tasting pancake! Place the sifted flour, salt and sugar into a mixing bowl. Whisk the egg yolks and coconut milk until well combined. Make a well in the centre of the flour and pour in the coconut milk mixture. Start stirring to make a thick batter. Stir gently, just enough to moisten the dry ingredients. Over-mixing leads to tough pancakes. Add in the grated coconut and corn kernels and mix again. Heat a non-stick frying pan over a medium heat. Brush the base very lightly with Q.B.B Ghee. Drop 3 tablespoons of the batter onto the pan, leaving a little room between each pancake. When bubbles begin to appear on the surface, flip the pancakes over and cook for another minute, or until golden brown. 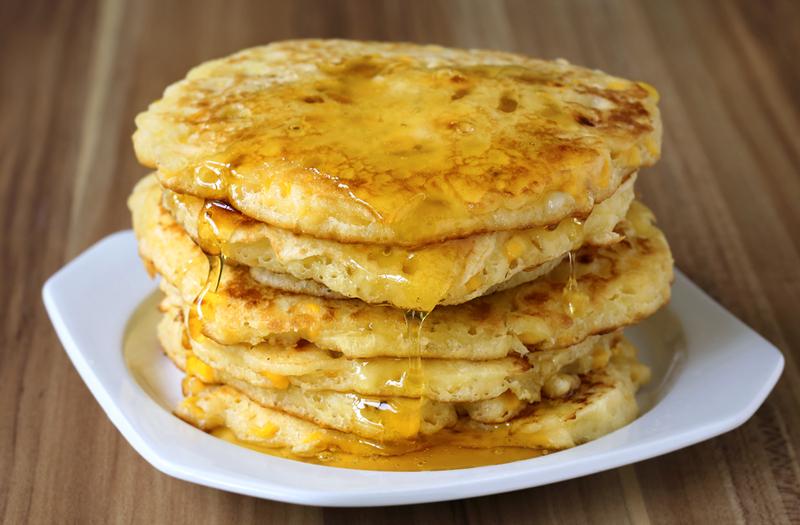 Serve the warm pancakes with Q.B.B Ghee and honey or maple syrup.